This solo art show is Mr. Downes's premier show of the year, featuring all of his newest Bronze sculptures, and original paintings, as well as signed and framed prints. 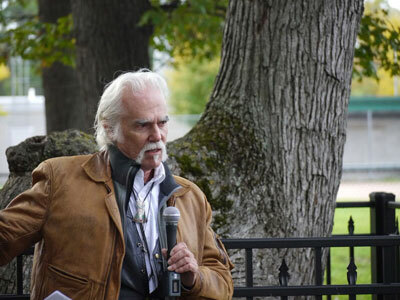 On Saturday at noon there will be a special dedication and blessing ceremony of the 16 foot sculpture of the Native American trail marker tree by Mr. Downes that will be installed at the Grove permanently. There will be Elders from the Native American community from several tribes participating and speaking at the dedication and Blessing of the sculpture. Mr. Downes is the author of the award-winning book Native American trail marker trees marking paths through the wilderness, there will also be the newest documentary video on his travels and meetings with Native American elders at trail marker trees throughout the Great Lakes region. 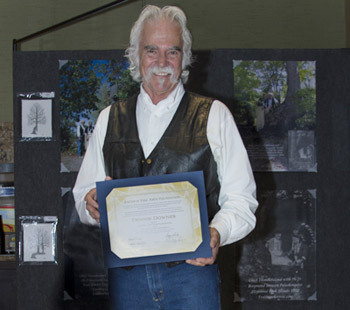 As part of this event for the past two decades Mr. Downes has exhibited the largest informational and photographic exhibit on Native American trail marker trees in the country. 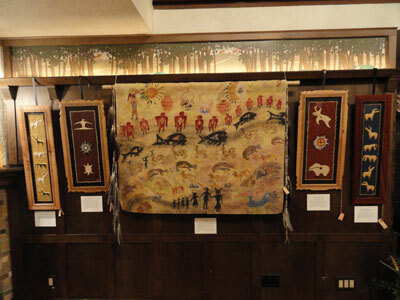 It has been updated every year with new documentation and collaboration between the author and the Native American community. The artist has also donated back a portion of the shows proceeds to the preservation of the Grove. 950 Hillside Avenue, Antioch, IL Mr. Downes is a founding member of the Antioch fine arts foundation and participates in this fundraiser every year. 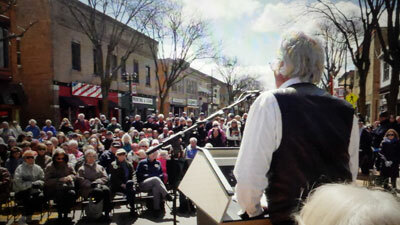 This year Mr. Downes showed a video of the blessing and dedication ceremony that was held on main street in Antioch. 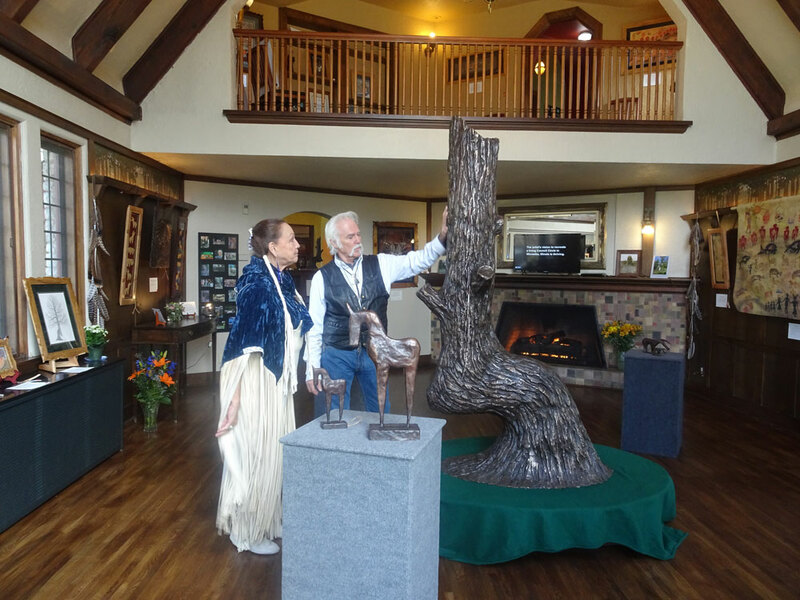 During the ceremony for the installation of his 7 foot bronze sculpture many members of the community spoke including the Mayor of Antioch and several Native American Elders spoke and performed ceremonial blessings of the artist and the sculpture. 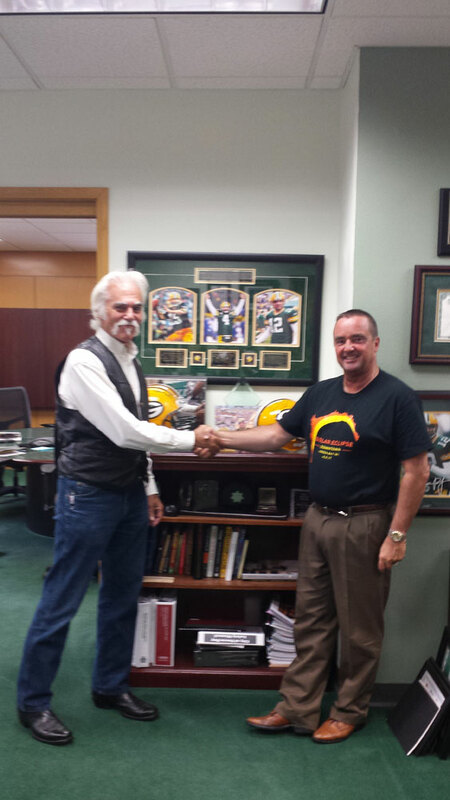 Mr. Downes also donates signed prints to the live auction and silent auction as well as signed copies of his book. This is a great event put on by our Art league, and I am proud to be part of it every year. 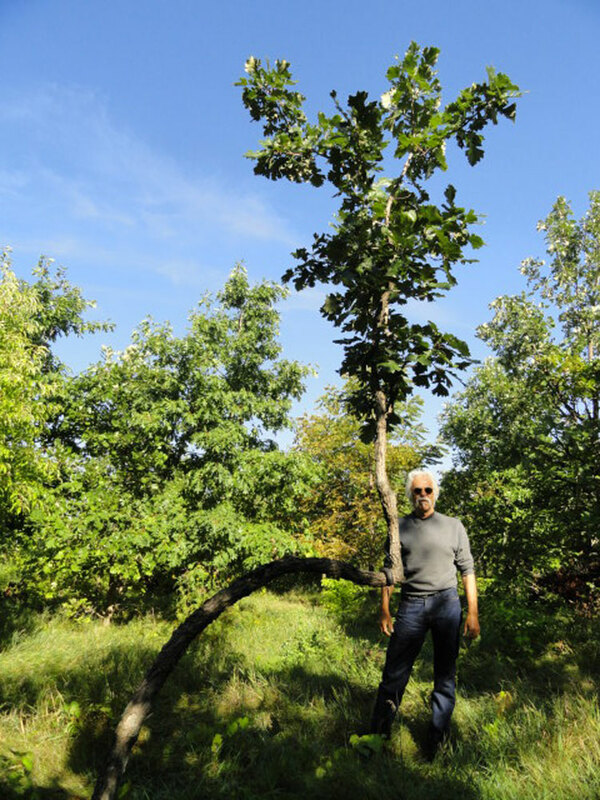 16 White Oaks were planted in a 80 foot diameter circle on a bluff known to have been an area of Native American habitation overlooking Lake Michigan. MC of the event was Gail spreen, other guest speakers included Lake County archaeologist Dan Melone who verified the significance of the site, Bernard Jacobs landscape architect who also spoke and acknowledged the significance of projects like this. Conservationist Jean Susie Schreiber was instrumental in introducing Mr. Downes to Executive Director of the Waukegan Park District Jay Lerner and Superintendent of Parks Scott MacLean. Menominee Elder Verlyn Spreeman and Mr. Downes planted the entrance tree at the most easterly part of the Council Circle completing the ceremony. This is the second Council Circle Mr. Downes has completed in our area working hand-in-hand with local Native American Elders. 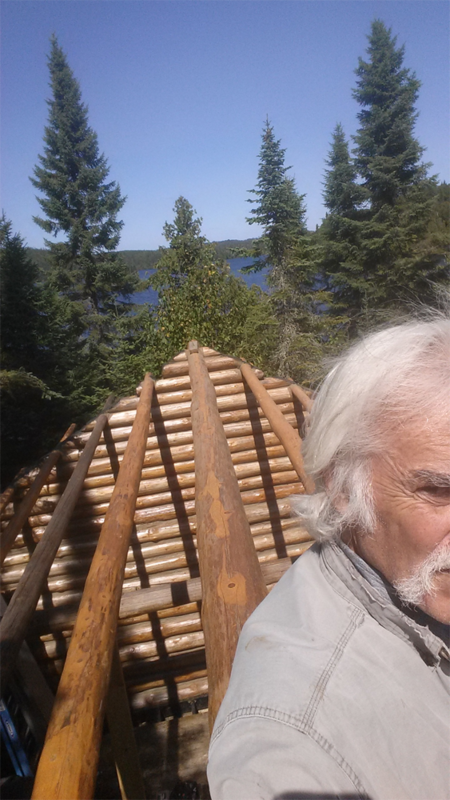 Mr. Downes has actually visited a Council circle made from living trees during his research for his book. 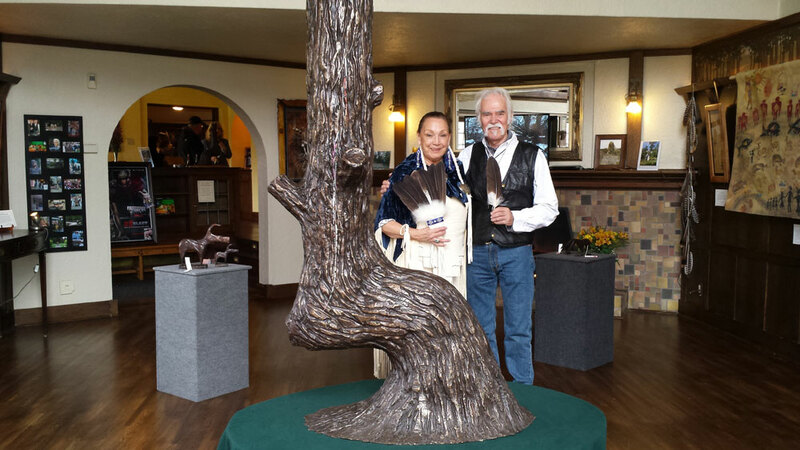 The Native American community has expressed its gratitude towards the artist, as the goal of the artist is as the trees grow in the Council Circle so will the friendships and knowledge between Native Americans and local residents. Installation of the Bronze Trail Marker Tree and Blessing Ceremony. It is so fitting that this event will be held on Arbor Day weekend; Arbor Day celebrates the role and importance of trees in our lives. Antioch and the Lake County area have a long history of documented Trail Marker Trees. Route 83 (Antioch's Main Street) was once formerly known to Native Americans as the Porcupine Trail. It is our hope that this sculpture will serve as a permanent reminder of this ingenious form of land navigation created by the area's first inhabitants, that was later used by fur traders and early pioneers. Special Guest, Emmy Award wining producer/director & cameraman Gary Donatelli will be filming the event for his trail marker tree documentary. Cherokee elder Andrew Johnson, president of the American Indian Chamber of Commerce for Illinois will be performing a blessing ceremony and giving a short talk. 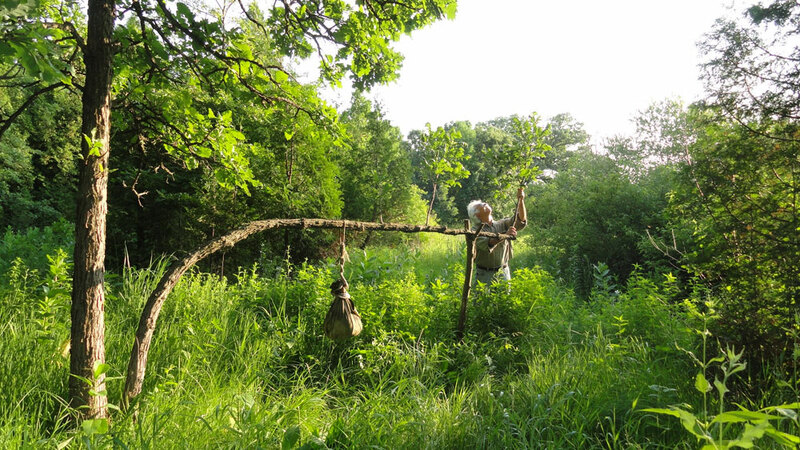 Hilda "Little Fawn" Williams, Ottawa and direct decendant of Chief Pontiac will also be speaking on her father's Chief Thundercloud and his knowledge of the Lake County Trail Marker Trees. "Thank you Dennis for such an enlightening presentation! The crowd, larger than usual, was captivated by the facts and photos. Your talk was both in depth, and attention keeping. I think everyone should see this bit of culture direction and history. Who knew! The secret language of trail trees crossed many tribes!" 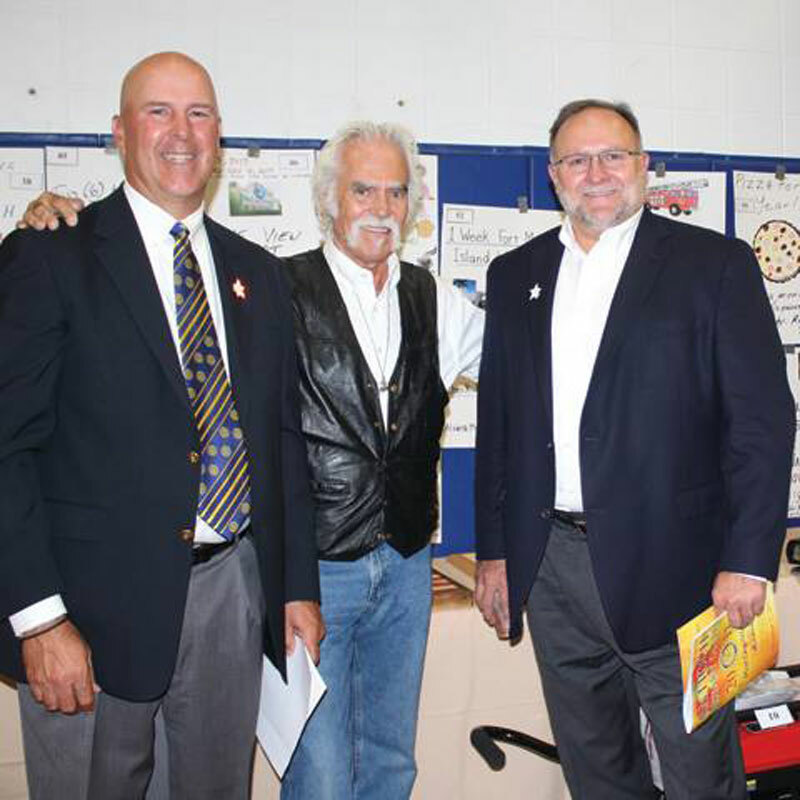 October 7th, 2017 Dennis donated a Signed Print of “Return to Sedona,” a signed copy of his book “Native American Trail Marker Trees: Marking Paths Through the Wilderness,” and a DVD of the movie “23 Blast” for the live auction. Over 100 items were in the live auction that raised a record amount for the fundraiser. This was a wonderful, successful, and well organized event. 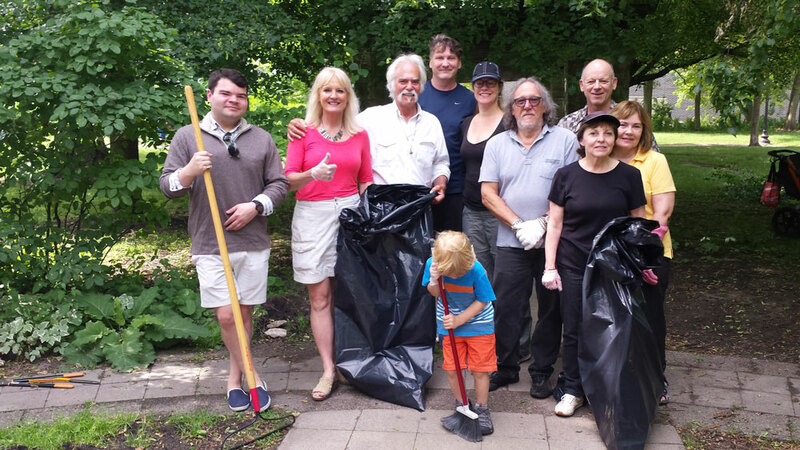 The Rotary Club of Antioch is an organization of service minded men and women that plan to carry out a remarkable variety of humanitarian, educational, and cultural exchange programs that touch people’s lives in their local communities and the world community. 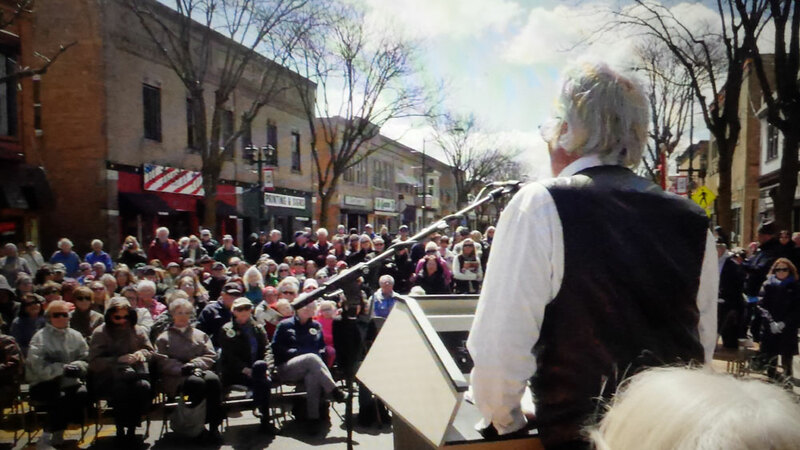 Dennis was proud to be a small part of this wonderful event. Special Thanks to Mayor Hanson. At Scuplture of Captain George Wellington Streeter Corner of East Grand and McClurg Chicago, IL. 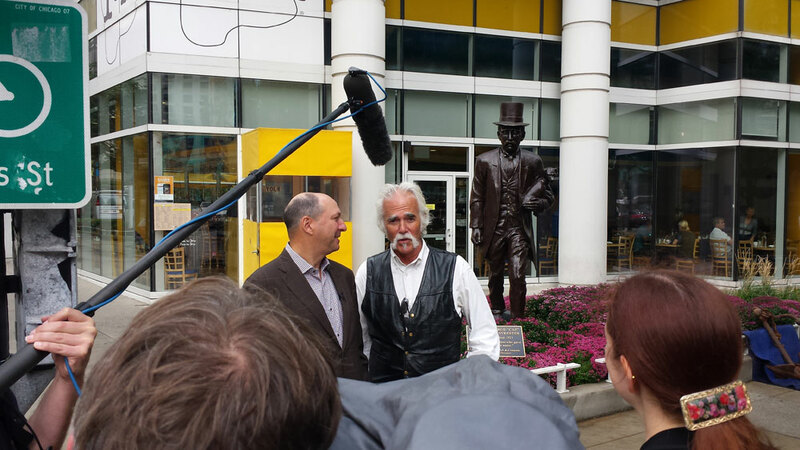 Oct. 3rd 2017 Filming for upcoming documentary on the history of Streeterville. 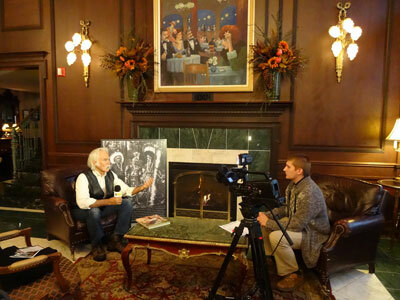 Catherine Haremski of HMS Video interviewing Lee Golub and Sculptor Dennis Downes. 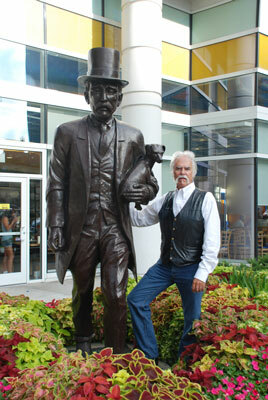 In front of the bronze scupture commissioned by Golub & Company and created by sculptor Dennis Downes. Friday, September 8, 2017 Dennis is a featured artist. 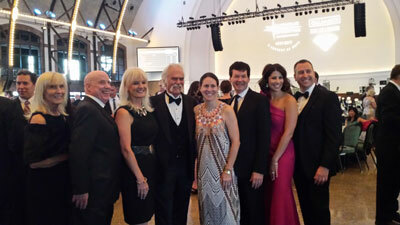 This will be Dennis's 14th time over the years participating in this Catholic Charities fundraising event. 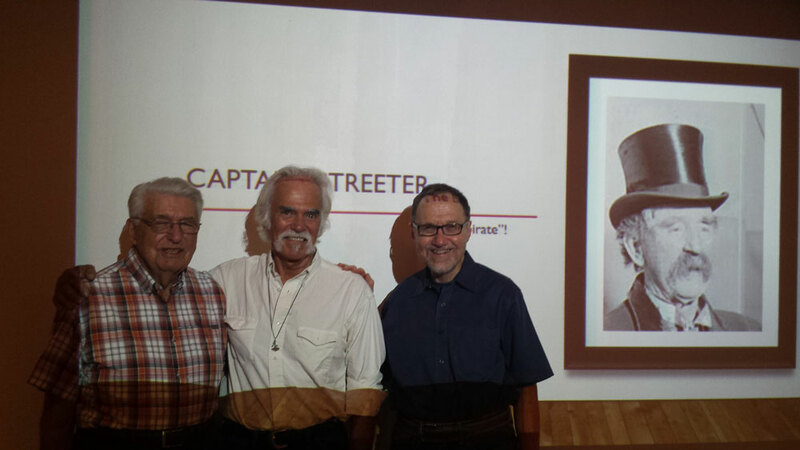 Chicago Maritime Museum August 18, 2017 Lecture by curator Don Glasell on Captain George Wellington Streeter. Don Glasell, Curator of the Chicago Maritime Museum and speaker guest sculptor of Captain George Wellington Streeter bronze Dennis Downes and Author and historian Richard Bales. Chicago Womens Magazine July/August issue 2017 Sculpture of Captain George Wellington Streeter and sculptor Dennis Downes appeared in the July/August issue (page 18) in the article entitled "Guide To Streeterville. 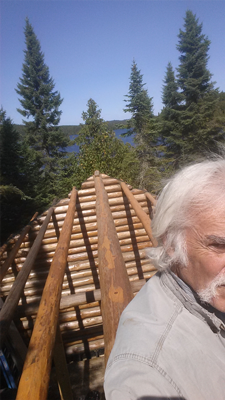 After Dennis's first trip back to Ontario this year spending two weeks in the Canadian Shield area he finished the trip up with a meeting in Sault Ste. Marie. The meeting was with Roxanne Toth -RISSANEN CEO/Dir. of public libraries Sault Ste. Marie. Dennis and Roxanne were finalizing next year's event in Sault Ste. 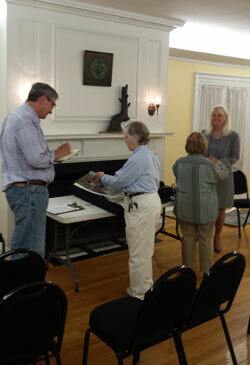 Marie which will be a lecture, exhibit, and showing of the latest video documentary on Mr. Downes's travels and working with Native Americans at actual Trail Marker trees, followed by a book signing. This event will take place next June details will be updated at the appropriate time. Jane Addams Park Sreeterville Neighborhood Chicago, IL. May 28, 2017 Jane Addams Park cleanup 32 volunteers showed up and spent the day cleaning up the park and beach on Lake Michigan. Waukegan City Council May 25, 2017 95 Jack Benny Drive Waukegan, IL. 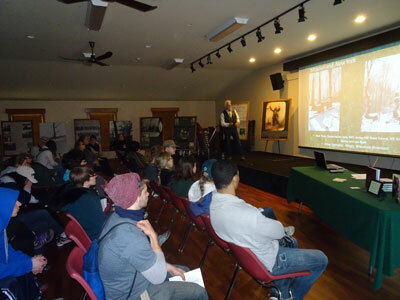 Trail Marker Tree Lecture and Book Signing The presentation took place at the Jane Addams Center focusing on the importance of the Trail Marker Trees of Lake County and the re-introduction of Council Circles by artist and author Dennis Downes. Wisconsin Single trunk directional Trail Marker Tree May 16, 2017 Dennis next to single trunk directional Trail Marker Tree he shaped in the late 1990's. The author has shaped Trail Marker Trees in several states and Canada going back nearly 30 years. Saturday, April 29, 10 am - 3pm. At Lake Katherine Nature Center and Botanic Gardens. Join us for this first of its kind festival in Palos Heights dedicated to nature and writing featuring guest speaker author Dennis Downes who will discuss his book Native American Trail Marker Trees: Marking Paths Through The Wilderness and give a demonstration of how to create a trail marker tree at Lake Katherine. 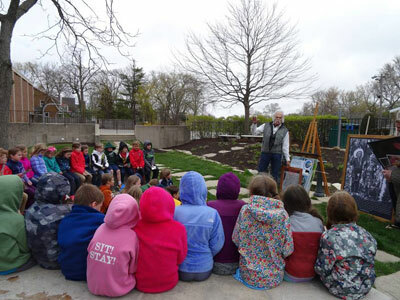 Dennis' lecture will be from 11 a.m. - 12 p.m. , followed by a tree planting. The festival will also include writing booths, create-a-poem wall, author and photography exhibits, art projects for children, a literary themed hayride adventure, and food vendors. This event is sponsored by Lake Katherine and the Palos Heights Public Library and is free to the public. 17th Anniversary Grove Show April 1st Special event took place on Saturday afternoon. Several members of the Ottawa tribe attendended the event. 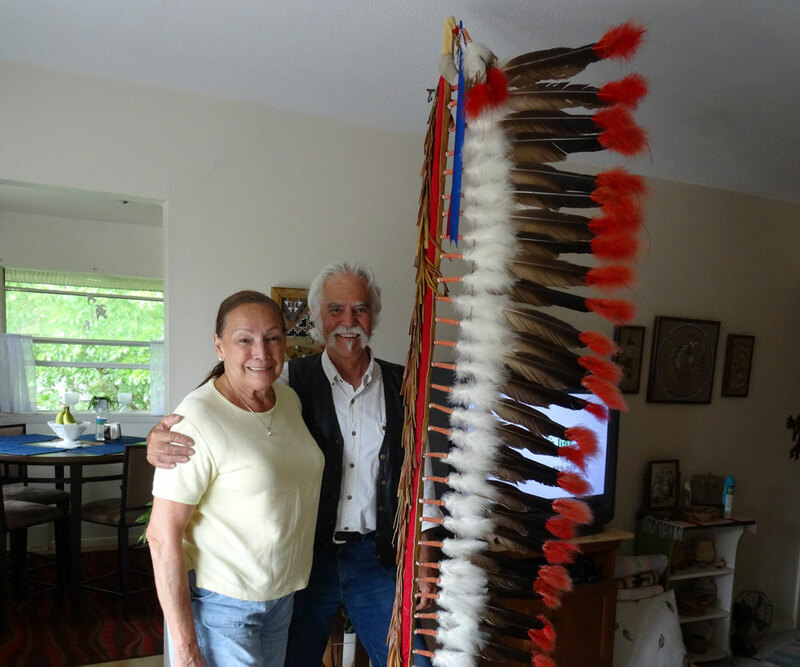 Hilda "Little Fawn" Williams presented Dennis with the Eagle Feather Award for his contributions to the Native American Community. 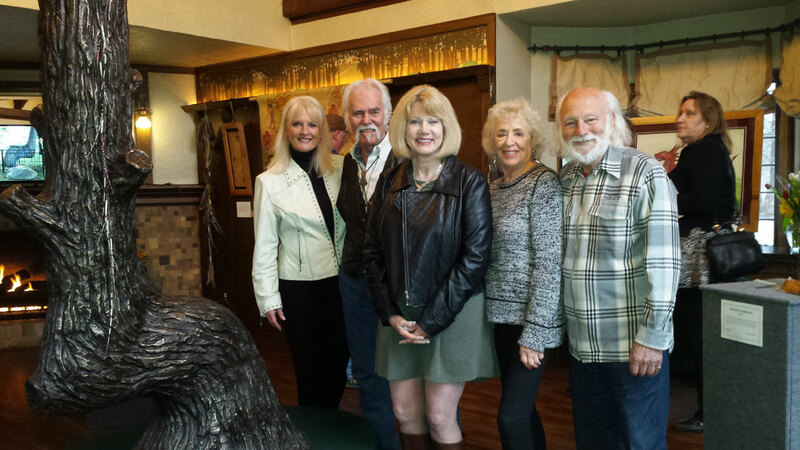 17th Anniversary Grove Show Opening night; March 30, 2017 Janet Davies was a special guest for the opening night and she also wrote the forward for the award winning book "Native American Trail Marker Trees, Marking Path's through the Wilderness." This March and April, Dennis will be having his annual solo show at the Grove Redfield Estate. His award winning artwork, both paintings and sculpture, will be on display and available for purchase. His newest originals and both small and large prints will be available. There will also be the largest and newly updated Trail Marker Tree Exhibit, featuring photographic and written documentation of the Trail Trees both past and present. Special part of this year's show will include new never before seen large and small bronze sculptures. Admission is free. Carol DeLorenzo, Redfield Coordinator, 847-298-0095. Milwaukee Public Museum Natural History Museum 800 W Wells St Milwaukee, WI. 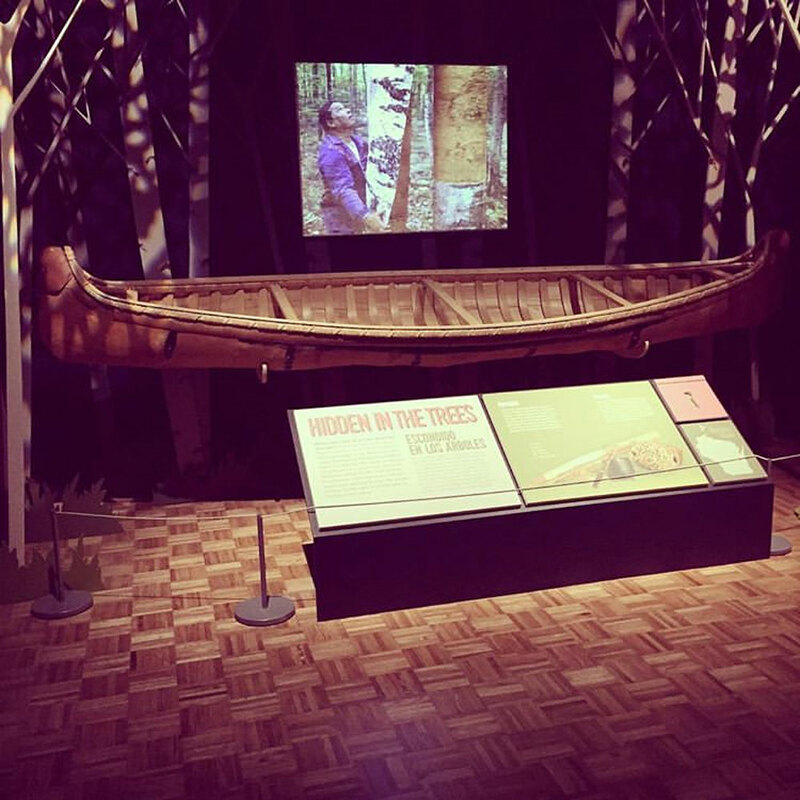 January, 2017 Earl Otchingwanigan Canoe Exhibit and Video "Hidden in The Trees" Dennis and Gail were honored to meet Christie and Earl Otchingwanigan at the Milwaukee public museum for a private explanation of the making of the Birch Bark Canoe on exhibit. Later they discussed recent trips to Native American Trail Marker Tree sites in Michigan and Iowa. Author, artist and trail marker tree expert Dennis Downes' consultation, vast knowledge, and expierence was invaluable to the Native American Trail Marker Tree placemaking project at the Grand Traverse County Civic Center in Traverse City. From crafting accurate language for the signage, to educating project managers about the tree's historical significance in our region and the greater context of our nation, Dennis' enthusiasm, passion, and generosity will always be appreciated by out community, especially the Grand Traverse Tribe of Ottawa and Chippewa Indians, who were honored during a special ceremony at the tree on October 25, 2016. I am grateful to know Dennis and to have leaned so much about trail marker trees. I've received many compliments on the project and on the ceremony from those who attended. It's one of the greatest things that's happened for County Parks and Recreation this year. I will never look at a tree the same, now, and seek out such trees when traveling. What a gift!" 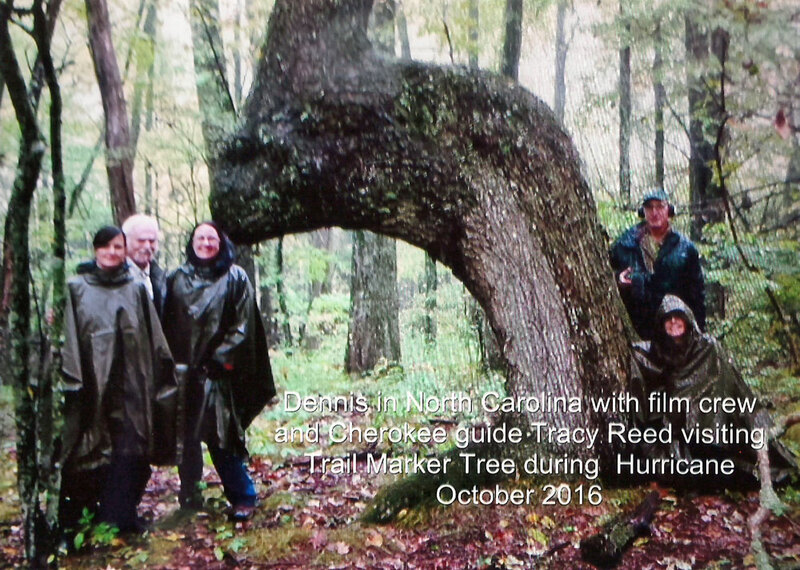 North Carolina Trail Tree Research Oct. 8 2016 Dennis was joined by a film crew with producer Gary Donatelli, Gail Spreen and Tracy Reed of Cherokee decent during hurricane to research and record this Trail Marker Tree. 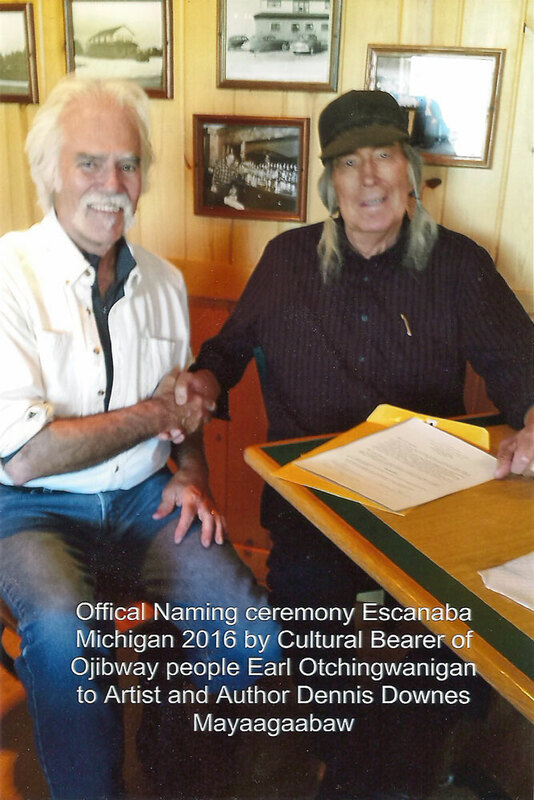 Naming Ceremony Escanaba, Michigan August 25th 2016 "It has been a long Ojibwe tradition to bestow an Ojibwe Name in honorarium on one who has over a lifetime has given much respect to Ojibwe and other Native Cultures" Professor Emeritus - Earl Otchingwanigan; Cultural Bearer of the Ojibwe people. 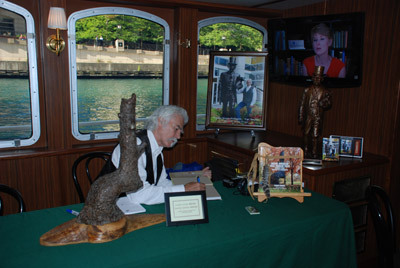 "Mayaagaabaw" Meaning "He Stands Foremost Amongst Others"
Trail Marker Tree Exhibit 432 East Grand Ave. Chicago, IL. 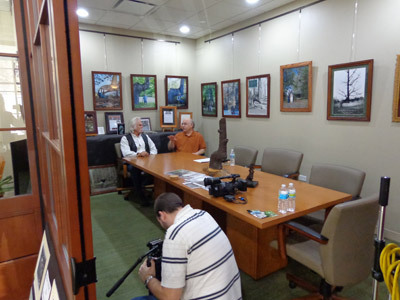 June, 2016 Reporter from local Chicago magazine interviewing author for an upcoming article regarding Trail Marker Trees and their ties to the Chicagoland area as refered to by Professor Raymond Janssen in the 1920's and 1930's. Ferris Fest Northbrook, IL. Hometown of John Hughes. Motion picture producer, director, and writer. May 20-22, 2016 Cheryl Fyne, Northbrook village offical and coordinator of the events that took place honoring the movie, "Ferris Bueller's Day Off". Written and produced by John Hughes. 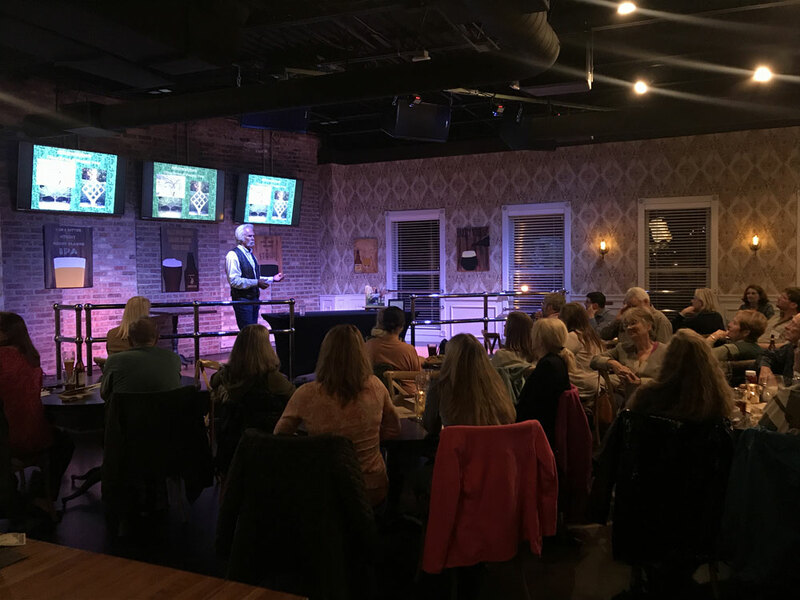 Dennis was asked to be one of the guest speakers for the event relating stories pertaining to their time spent at at Glenbrook North High School in art class together and field trips they took to The Art Institute in Chicago. Dennis was proud to be part of this event. 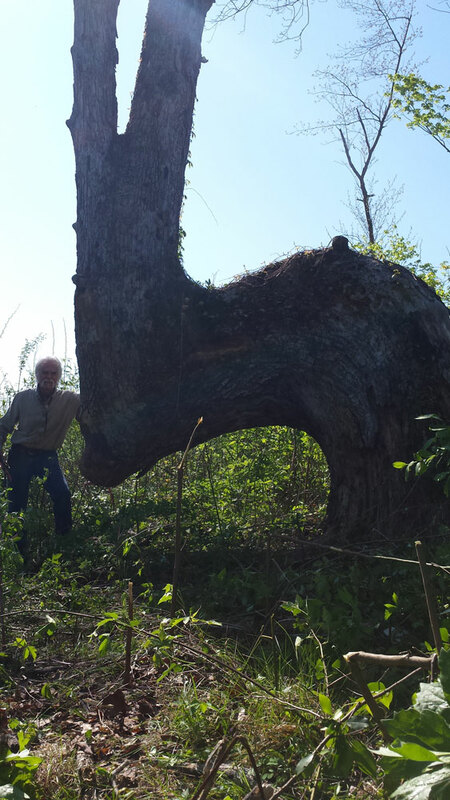 Salem Wisconsin Double trunk Trail Marker Tree May, 2016 Dennis next to double trunk Trail Marker Tree he shaped with arborist Brian Buchholz. 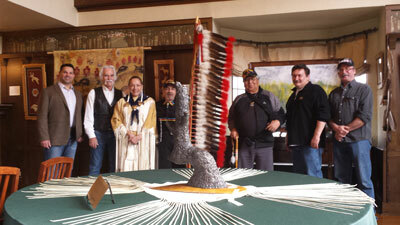 Dennis has tried several techniques over the years taught to him by Native Americans and historians. 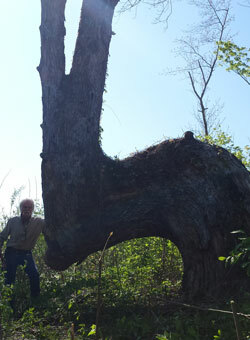 Des Arc, Missouri Trail Marker Tree May, 2016 Author Dennis Downes next to famous Des Arc, Missouri Trail Marker Tree. This Oak tree is over 40" in diameter on private property. The land owners going back generations protected the Trail Marker Tree that pointed to a still active and crystal clear spring. Foresters, teachers and school children were brought to this tree to learn of the use of the Trail Marker Trees in this part of Missouri. Trail Marker Tree Exhibit 432 East Grand Ave. Chicago, IL. May, 2016 Pictured is Timothy A. Schuler, Contributing Editor for Landscape Architecture Magazine meeting with author Dennis Downes for the 3rd time regarding the article entitled "Searching For A Sign" that appeared in the November issue, 2016 Landscape Architecture Magazine. The 6 page article discussed the history of the Trail Marker Tree and the relationship to the Great Lakes Region and beyond. Joeseph Sears School Kenilworth, IL. 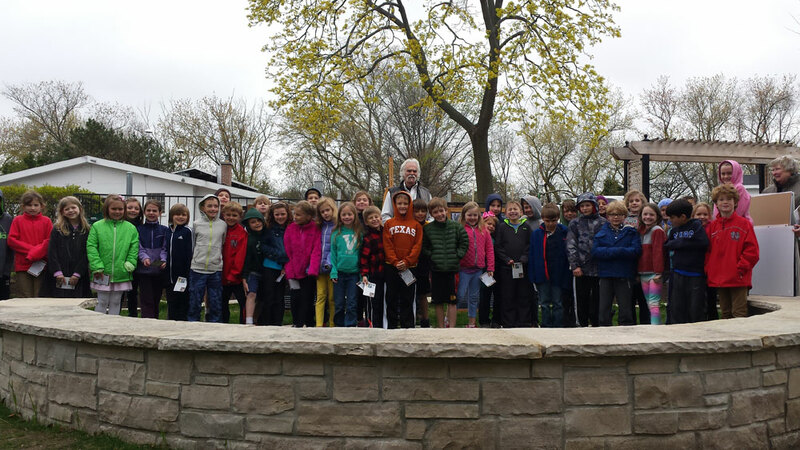 May 3rd, 2016 Dennis revisited the school for the 3rd year, where he gave a lecture to the students about the trail marker trees and their area's special connection to the history of the trail marker trees. 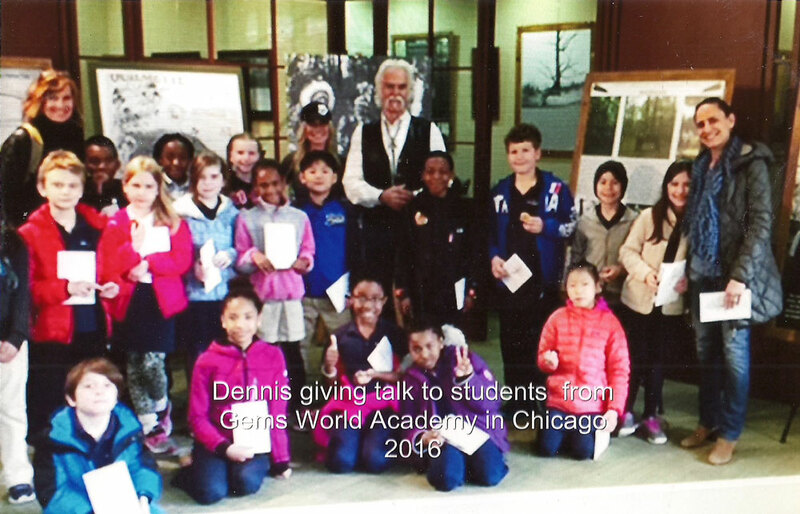 GEMS World Academy April 29th 2016 432 East Grand Avenue Chicago Trail Marker Tree Exhibit Dennis gave a lecture to the students of the GEMS World Academy of Chicago of uses and history of the Trail Marker Trees. "The students came back so full on new knowledge and enthusiasm for this added information about the trail marker trees, how they were made and used. "Stephanie Nelson, Educator, GEMS World Academy. This March, Dennis will be having his annual solo show at the Grove Redfield Estate. His award winning artwork, both paintings and sculpture, will be on display and available for purchase. His newest originals and both small and large prints will be available. There will also be the largest and newly updated Trail Marker Tree Exhibit, featuring photographic and written documentation of the Trail Trees both past and present. Admission is free. Friday, October 16th from 6-10 p.m.
For more information and tickets please visit www.hungerresourcenetwork.org Hunger Resource Network's Second Annual Fundraising Event, Rock 'N Roll Revisited. This event will be hosted by Pinstripes: Bowling, Bocce, Bistro in Northbrook. 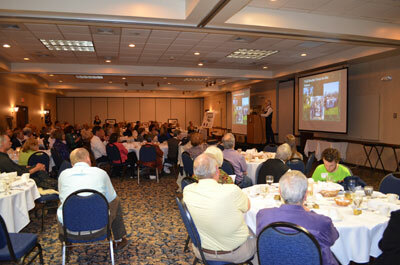 Hunger Resource Network is an all-volunteer organization that is dedicated to the alleviation of hunger. 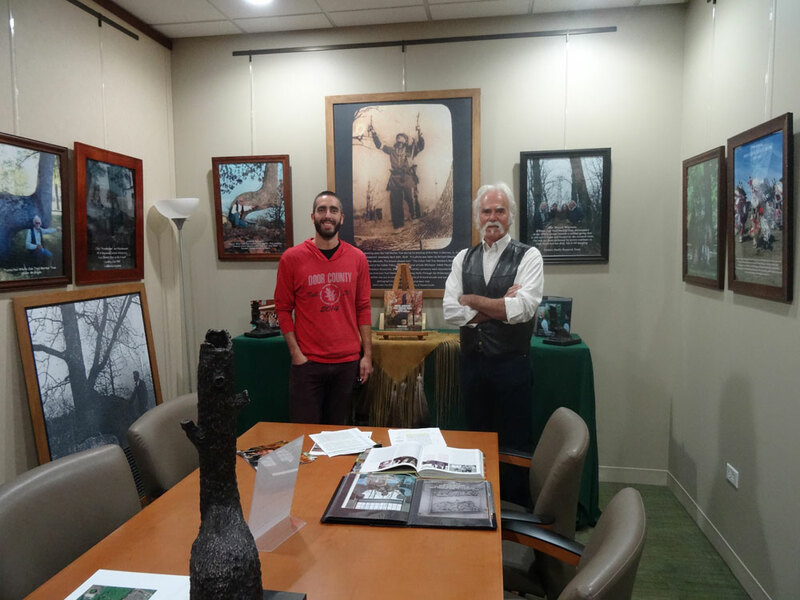 Dennis will be donating a print of one of his award-winning pieces, a signed DVD of "23 Blast" and a signed book, "Native American Trail Marker Trees: Marking Paths Through the Wilderness" to this event. Tickets for this event are $75 per person and the event includes: entertainment, appetizers, dinner, silent and live auction, wine and a cash bar. Hunger Resource Network's: "Rock 'N Roll Revisited"
Friday, October 9th, from 5:00-8:30 p.m. This event will include original artwork, raffle prizes, door prizes, a wine tasting and much more! Dennis is a founding member of the Antioch Fine Arts Foundation; he will be donating several items to help raise funds to support this wonderful foundation. Please join them for this fun filled event (admission is free). Thumbs up to director Dylan Baker and producer Gary Donatelli for having their movie rated 14th out of the top 100 Christian films for 2015. 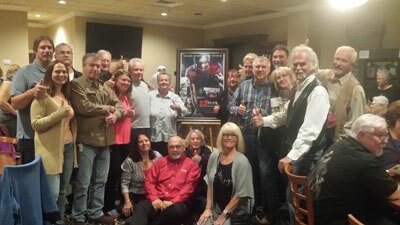 Dennis donated a copy of the movie as part of the fundraiser. 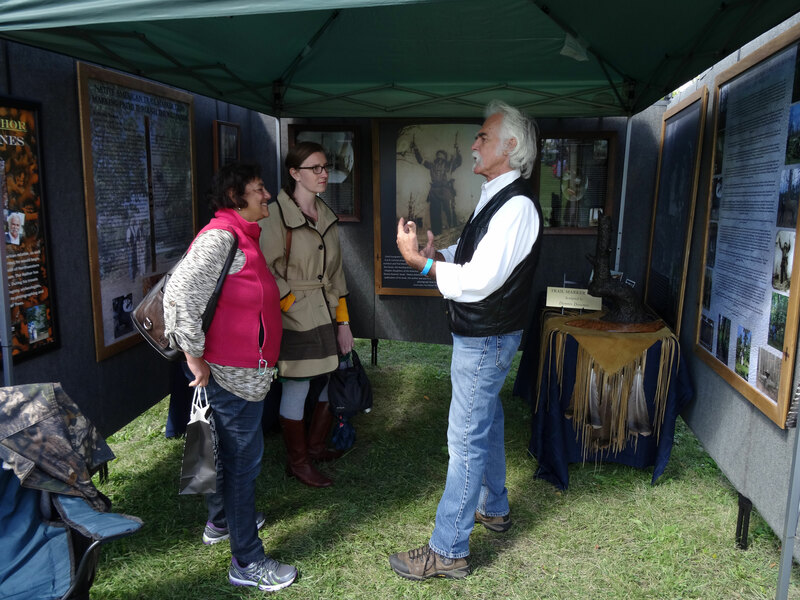 61st Annual Pow Wow American Indian Center September 26, 2015 Chicago Illinois Author Dennis Downes was asked to have a small exhibit on the Trail Marker Trees as part of the 61st annual Pow Wow Busse Woods in Schamburg, IL. at the request of Andrew Johnson, Executive Director of the American Indian Center. Pictured is Alaka Wali, curator of North American Anthropology at the Field Museum in Chicago with her assistant discussing the Trail Marker Trees and their relationship to the Great Lakes Region. Dennis has been asked to be a consultant reguarding the Trail Marker Trees and their relationship to our area. July 13, 2015 Eagle Staff Restoration Muskegon, Michigan Hilda "Little Fawn" Williams, daughter of Chief Thundercloud, with artist Dennis Downes. Dennis had a small part to play at the request of Hilda to make the physical shaft for the eagle staff. This eagle staff is brought out on to the ice during the Chicago Blackhawks games to honor Native American Veterans. A special outdoor presentation Trail Marker Trees and Native American History. Trixter Art Gallery Schamburg, IL. 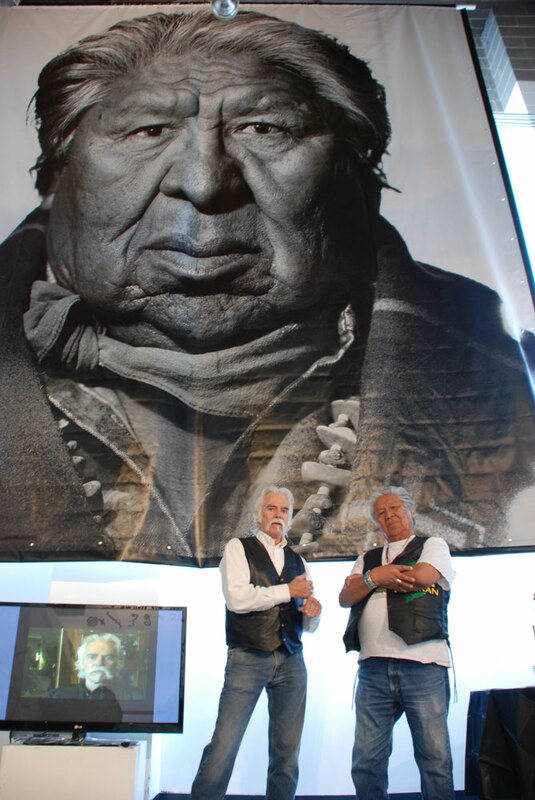 April 18th 2015 Trail Marker Tree researcher Dennis Downes with Joe Yazzie in front of photograph of Joe Yazzie that appears in the vanishing culture project entitled " Butterflies and Buffalo" by famous photographer Dennis Manarchy. Photograph of Dennis also appears in this project. Joe and Dennis spent time discussing different little known customs of the native americans, including the use of the Trail Marker Trees, standing stones, pictographs and petroglyphs. 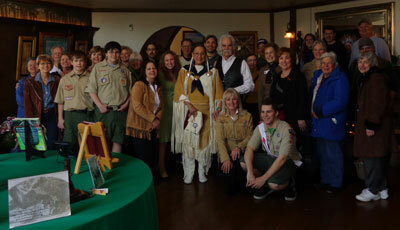 Special guests Gary Donatelli producer and director, Andrew Johnson Executive Director American Indian Ctr. and Hilda little fawn Williams, Elder from the American Indian Ctr. art students from Glenbrook North were given a private lecture and tour of the show by the artist. 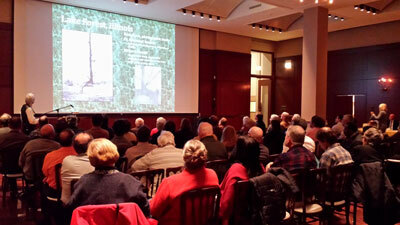 Dennis will be giving a presentation for the Chicago Map Society regarding the Native American Trail Trees. This event is free and open to the public. This event is co-sponsored by the D'Arcy McNickle Center for American Indian and Indigenous Studies and the Hermon Dunlap Smith Center for the History of Cartography, both at the Newberry Library. Dennis' artwork is on display at the downtown Studio. Opening night is the Holiday Open House and his Artwork will remain on display until the end of January. To schedule an appointment for a private showing please contact Downes Studio at 847-395-8875. January 9th, 3:30 p.m. Northbrook Voices, An Oral History Project Sponsored by the Northbrook Historical Society and the Northbrook Public Library Recorded Interview that will be preserved in the permanent collections of the Northbrook Historical Society and the Northbrook Public Library. 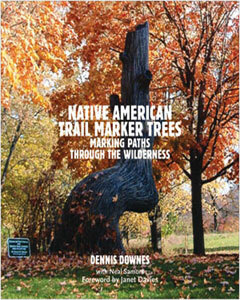 Planned during Native American awareness month - the Marquette Regional History Center will be hosting Dennis Downes for an educational lecture and exhibit about Trail Marker Trees and a book signing. Special guest, Earl Otchingwanigan (Professor Emeritus of Ojibwe Language, Consultant for the Smithsonian Institution Folk Life Programs) will be joining Dennis for this event. 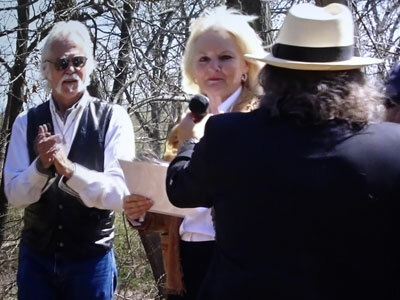 Dennis and Gail are looking forward to their trip to Lexington, Kentucky for the Red Carpet Premier of the movie this coming week on October 23rd. They will be joining all the stars for this spectacular event, including Stephen Lang, who plays the football coach (starred in Avatar). The Kentucky Homecoming Lexington Premier of "23 Blast" with the actors, writers, and producers in attendance will be benefitting the Visually Impaired Preschool Services. Don't forget to go see the movie in Theatres! It comes out October 24th Nationwide! Saturday, October 11th at noon, Glenbrook North High School's Theatre will be airing the special sneak preview of the movie "23 Blast" Producer, Gary Donatelli, GBN class '69 will be attending this special event. This event is open to the public and admission will be free! Come and join us for the sneak preview of this inspirational movie! Glenbrook North High School is located at 2300 Shermer Rd, Northbrook, IL 60062. Mr. Downes donates his artwork to this event every year to help support the AFAF who's mission is to serve our community by providing education, resources and a forum for the creation and expression of visual arts for members and residents. 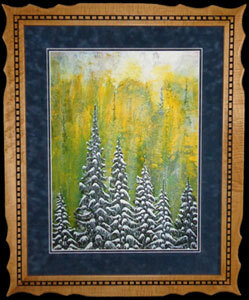 Dennis will be exhibiting additional information regarding the Trail Marker Trees and selected pieces of art. AIC is proud to have a friend such as Dennis participating. Please come to enjoy the pageantry, song and dance as we celebrate Native American culture. - Andrew Johnson, Executive Director, AIC. 10a.m. - 4p.m. Sunday, July 13th The show will be open from 10 a.m. - 5p.m. on Saturday, July 12th and from 10a.m. - 4p.m. Sunday, July 13th. Don't miss this great event! This beautiful artful experience is set in the picturesque Village Green Park, with its tree lined paths and hometown feel. Art in the Park - A Northbrook Fine Arts Festival presents the highest quality in fine art and will have over 60 Artists displaying their work. In addition to the beautiful artwork, this highly anticipated event will have food vendors, live music, children's activities, and more! The parking and admission are free for this event put on by the Northbrook Arts Commission in Collaboration with the Northbrook Park District and E&M Events. 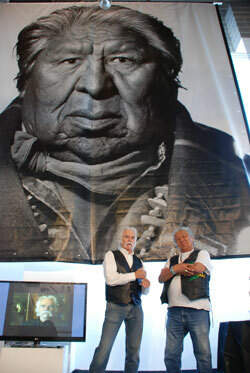 June 13th, the Exhibition "Butterflies and Buffalo: Part II An American Portrait" will be opening in Chicago. This exhibit, by Dennis Manarchy, will capture some of the seldom seen faces and vanishing cultures from all across the country. Manarchy will be using his giant 35-foot long camera to capture tremendous detail. Manarchy selected our very own, Dennis Downes, to be one of the faces captured as part of this exhibit. Dennis Downes attended this special opening. Mr. Downes is donating a signed copy of the book "Native American Trail Marker Trees: Marking Paths through the Wilderness" and a signed print. Opening night: April 11th from 7p.m. to 9:30 p.m. 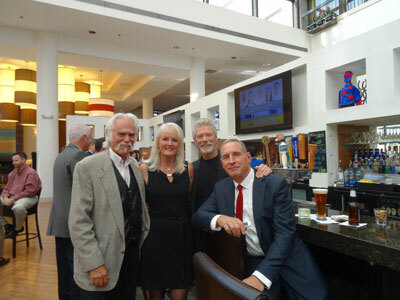 The Trickster Art Gallery increases the visibility and impact of contemporary cultural arts and education through all arts media, music, veterans, fatherhood, and social justice issues to advance these programs. 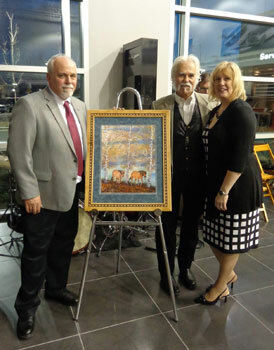 On March 23rd, Shore held its Spring Benefit called Plant Your Dreams At Shore at the brand new Fields Chrysler Jeep Dodge and Ram dealership, 2800 Patriot Blvd. in Glenview. Shore community services have been providing exceptional services to individuals with intellectual and other developmental disabilities in our community for 61 years. This March, Dennis will be having his annual solo show at the newly renovated Grove Redfield Estate. His award winning artwork, both paintings and sculpture, will be on display and available for purchase. His newest originals and both small and large prints will be available. There will also be a large educational Trail Marker Tree exhibit on display and a book signing for his newly published book, "Native American Trail Marker Trees: Marking Paths Through the Wilderness." 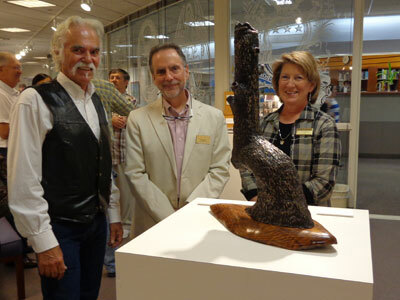 Dennis' newest bronze pieces will be on display. Wine and hor'dourves will be served and admission is free. Dennis will be at the Kenosha location Gander Mountain signing and selling books from 9 a.m. to 5 p.m., be sure to stop out and get a book! Golden, CO 80401 Mr. Downes will be giving an educational lecture and presentation about the Trail Marker Trees, following which he will be personally signing books for all visitors. 950 Hillside Ave Antioch, IL 60002 A spectacular event you won't want to miss! The annual fundraiser is scheduled for Friday, October 18 from 5:00pm - 8:30pm at a new location: Anastasia's Restaurant & Sports Lounge (950 Hillside Ave Antioch, IL 60002). Dennis will be donating framed prints to this event and will be present for the entire event. All artist's work donated is 100% donation - another way to share the diverse world of art for others to enjoy. All funds raised enables the continuation of the Foundation to reach out to our community! 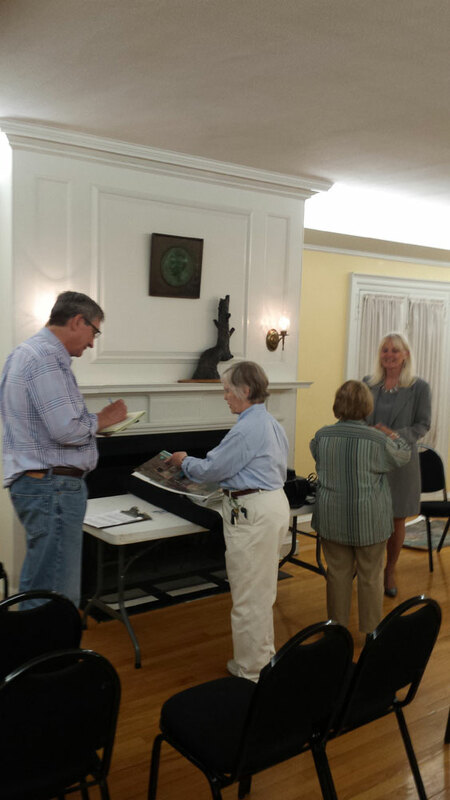 Trail Marker Tree Lecture and Book Signing. 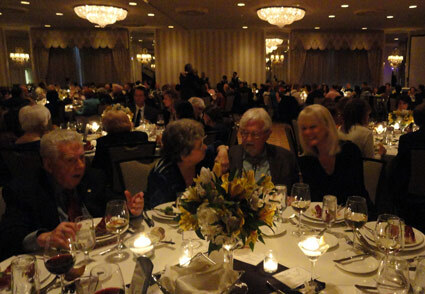 Park Ridge, IL The Twenty-first Star Chapter, NSDAR (National Society Daughters of the American Revolution) is looking forward to hearing Dennis give a presentation on Saturday, October 12, 2013 at the Park Ridge Country Club in Park Ridge. Neighboring chapters are welcome to attend. 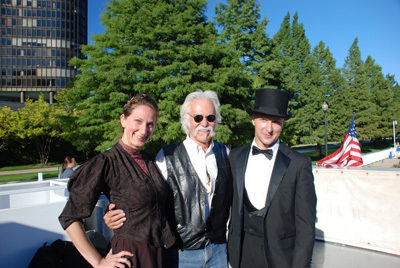 Streeterville: The Play The Theatre Hikes group will be performing Streeterville: The Play. This play will showcase the life of Cap, his mishaps, and contributions to the community named in his honor. The performance will take place at Navy Pier's Gateway Park South from 1:00 - 4:00 pm, followed by a reception on the north wall of Ogden slip aboard the Celebration yacht, courtesy of Shoreline Charters. 400 W. Front Street, Harvard, IL This show will help raise funds for The Land Conservancy of McHenry County. Dennis will be displaying some of his Original works and will have books for sale. Please join us! Downtown Antioch, 10a.m. - 4p.m. The Antioch Fine Arts Foundation will be having their annual Art on the Lawn while celebrating the opening of their new Gallery! Dennis will be present for the event. Grayslake, Il 60030 Dennis will be displaying some of his beautiful landscape paintings as well as his newest, never before seen, bronze Trail Marker Tree Sculptures. Dennis will also have a small educational Trail Marker Tree exhibit. The college has created and will be presenting some impressive broadside story boards explaining the Trail Marker Trees to accompany Dennis work. The show runs from July 8th through August 16th. The C-Wing entrance is the easiest access. Look for signage for the gallery when inside the building. 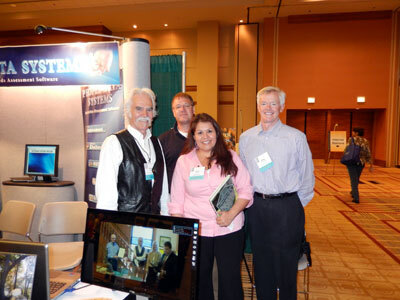 Held at the Sheraton Chicago Hotel & Towers (301 East North Water Street, Chicago, IL) NAIHC's most longstanding annual event, the Annual Convention and Trade Show is an opportunity to learn about tribal housing, attend training courses, and network with successful housing professionals as well as vendors from across the country. Housing Data Systems hosted Mr. Downes' small Trail Marker Tree Exhibit and Book Signing as part of their company presentation for this convention. “A New Twist in Time” As part of the Arbor Day and Earth Week Celebration in Green Bay, Mr. Downes will be returning to shape three sapling trees into Trail Marker Trees along the beginning of the Green Bay Trail. Mr. Downes will also be presenting an educational lecture about the Trail Marker Trees. 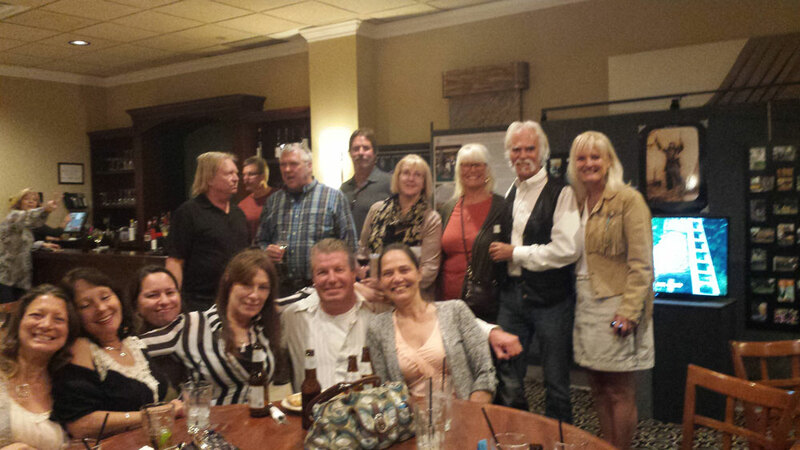 A special thanks to Jim O’Rourke for his efforts to organize this event. Ravinia in Highland Park. SHORE Community Services have been providing exceptional services to individuals’ with developmental disabilities for over 60 years. Mr. Downes has participated in this annual fundraiser for the past 13 years, helping to raise funds by participating and donating artwork for the live auction, as well as items for the silent auction. For more information and/or tickets please contact Mary Matz at (847)-982-2030 ex. 21. Thursday, March 21st from 5 p.m. - 10 p.m.
Friday, March 22nd from 12 p.m. - 10 p.m.
Saturday, March 23th from 12 p.m. - 10 p.m.
Sunday, March 24th from 12 p.m. - 5 p.m. This March, Dennis will be having his annual solo show at the newly renovated Grove Redfield Estate. His award winning artwork, both paintings and sculpture, will be on display and available for purchase. His newest Originals and both small and large prints will be available. There will also be a large educational Trail Marker Tree exhibit on display and a book signing for his newly published book, "Native American Trail Marker Trees: Marking Paths Through the Wilderness." Over the past year the Grove Redfield Estate has been newly renovated, making this show's setting truly exquisite and surrounded by the beauty of nature. Wine and hor'dourves will be served and admission is free. 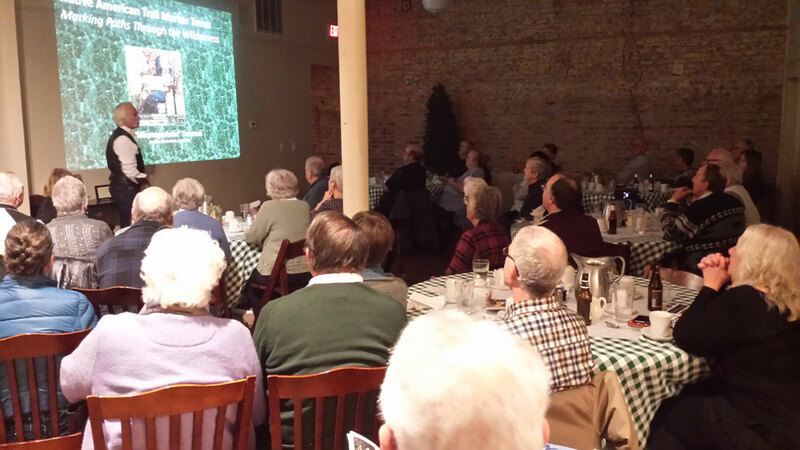 Dallas, Texas The Dallas Historic Tree Coalition hosted a lecture and book signing for Mr. Downes in Dallas, Texas. Before the event Mr. Downes was interview on the local ABC News station. "We were honored to host Dennis Downes for a lecture and book signing in Dallas Texas. The event was a great success, drawing over 120 people - professors, students, Master Naturalists, Mater Gardeners, American Indians, families with young children, and people who simply love to hear about these wonderful Trail Marker Trees. 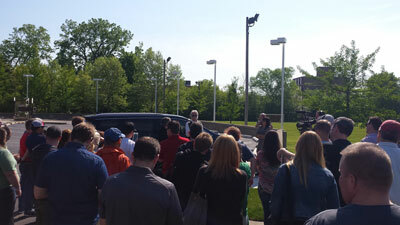 Many traveled to hear Dennis speak, some as far as 350 miles. The appeal of this subject is wide, and we were delighted to showcase Downes' depth of knowledge and good information to so many enthusiastic listeners. The lecture was interesting, and the photographs and supporting material were excellent. After the lecture, the momentum continued as many attendees stayed to talk with the author and have him sign their books. It was a rare opportunity to hear one who has invested a lifetime in this research, and for a moment, we got a glimpse of what it must be like to walk those trails with Dennis, and to live in a world that requires an entirely different set of skills to survive. 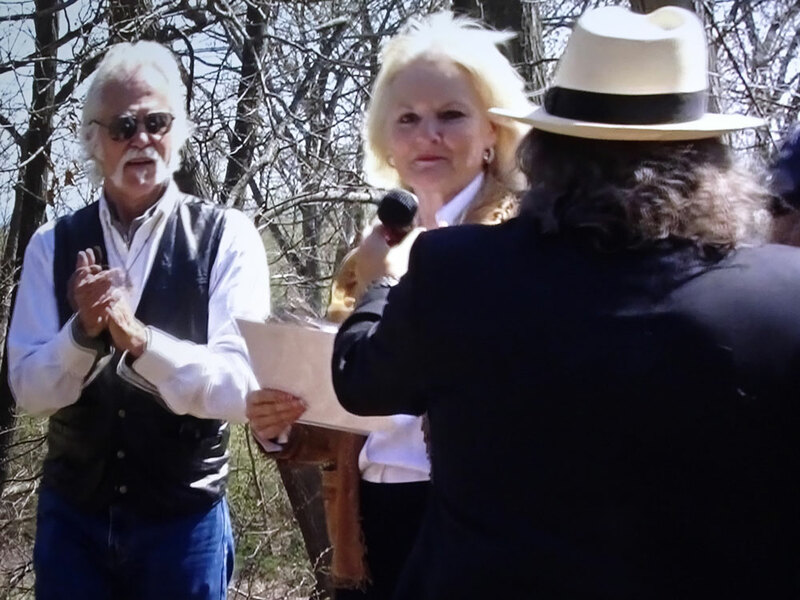 As a group that works to bring the stories of these great historic trees to the public, we were delighted for the awareness that Dennis raised in our community. 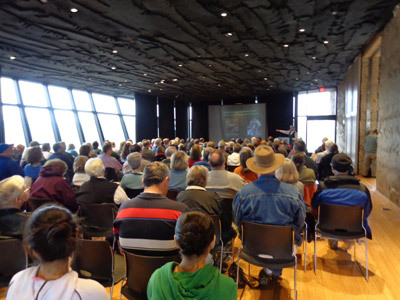 Best of all, as a result of Dennis' lecture, there are new enthusiasts in our landscapes watching for these trees, and there is a greater urgency to learn about them, protect them and recognize them for the treasures that they are." 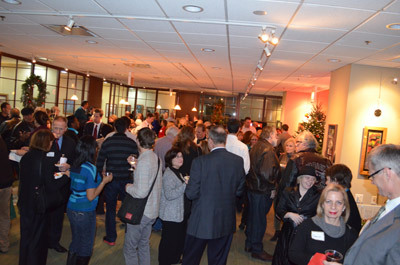 December 3rd, 2012 Annual Art Show and Holiday Party Held in Downtown Chicago. Antioch Fine Arts Foundation Annual Fundraiser and Award Presentation Mr. Downes donates his artwork to this event every year. 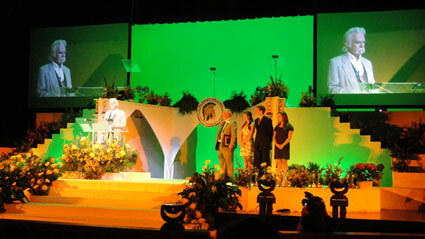 During this year's event Mr. Downes was awarded the Honorary Lifetime Membership from the Foundation. Filming of Upcoming Documentary by JoBe Cerny Mr. Downes was interviewed for his expertise on the Native American Trail Marker Trees. Filming was on location in Highland Park, Lakes Region Historical Society, and Mr. Downes' Trail Marker Tree Exhibit in Chicago. 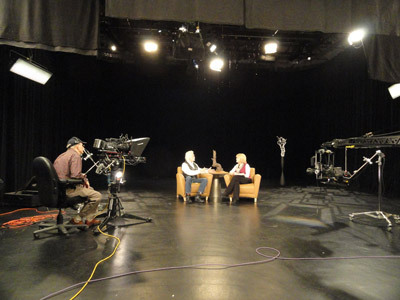 March 20th, 2012 Filming of the Podcast on JDI with Janet Davies, ABC An in-depth interview regarding the release of Mr. Downes' new book and the history of the Trail Marker Trees. This event is held every year to honor and award scholarships to the graduating seniors for outstanding scholarship, athleticism and participation in extracurricular activities. Mr. Downes is to receive the Distinguished Alumnus Award for 2012, for his artistic accomplishments and the completion of his book. Native American Trail Marker Trees Marking Paths Through The Wilderness. He has also been asked to give a short speech at the event. 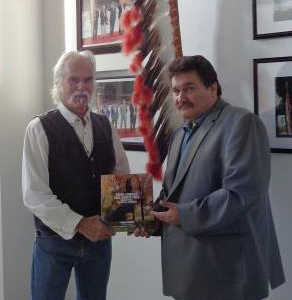 Mr. Downes is donating a signed copy of the book "Native American Trail Marker Trees: Marking Paths through the Wilderness" and a signed print of the art piece entitled "Wilderness Coast". Thursday, March 8th from 5 p.m. - 10 p.m.
Friday, March 9th from 12 p.m. - 10 p.m.
Saturday, March 10th from 12 p.m. - 10 p.m.
Sunday, March 11th from 12 p.m. - 5 p.m. 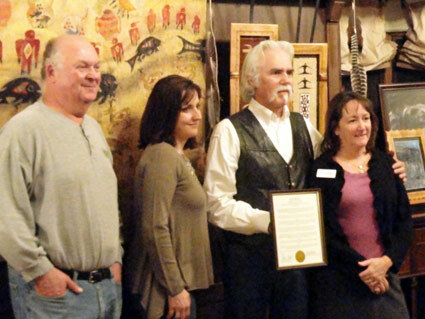 Receiving proclamation from the Glenview Park District for dedication, notable accomplishments, and continued efforts towards the preservation of The Grove. 757 North Main Street (Route 83), Antioch, IL 60002 The Antioch Public Library will be hosting a public book signing with local author, Dennis Downes, for his new book Native American Trail Marker Trees: Marking Paths Through the Wilderness. Hard Cover Books and the Special Limited Edition books will be available for sale. downesstudio@earthlink.net or telephone (847) 395-8875.